Meet Grandma Lek (and yes, she is small). 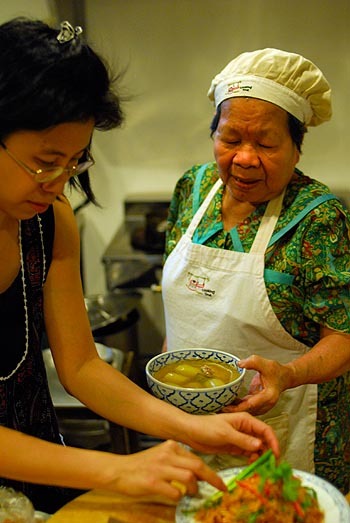 She’s the hands and heart behind the food at a fantastic new little Chiang Mai spot called, appropriately, Grandma’s Thai Recipes. There she is above, making one of her specialties, mee krob. 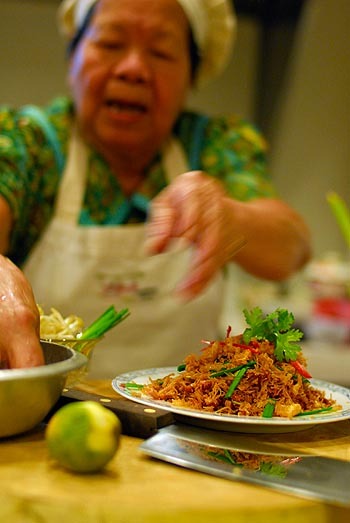 Grandma has long cooked for a popular restaurant on one of Chiang Mai’s outer ring highways. But granddaughter Jib and her husband opened the new spot in February with an aim toward foreign eaters. It’s tiny, and it looks like one of those arty little cubbyhole restaurants on Bangkok’s Phra-A-Thit Road. Grandma’s sits near Thapae Gate on the moat road, perhaps an unlikely area to find Thai food of this caliber. But it’s here, and Grandma awaits you. So does Jib. She looks forlorn, glancing at the street as tourists browse her menu and pass right by. She says backpackers complain her prices are too high (apparently $7-$10 is too much for a fresh two-person meal cooked in an open kitchen right before the eyes). 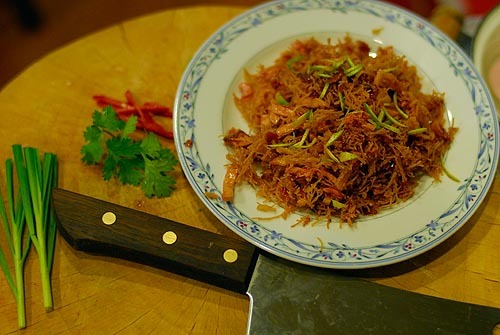 Problem is, Jib wants to offer real Thai food, healthy food, food cooked the way Grandma likes to cookâ€”but she thinks tourists want 20-baht noodles, sandwiches and fruit drinks instead. She’s thinking of finding a decent bread supplier so she can add Thai sandwiches to the menu, in addition to Grandma’s homestyle recipes. Jib asks her guests for advice on attracting and keeping foreign customers. One young man, a nutritionist, advises her to promote her healthy ingredients. I ask if she cooks with organic foods. Her answer: yes, when she can. She keeps her own organic garden and buys organic when possible. But some supposedly organic ingredients in Thailand are not always so. (This is substantiated by the farmers I have interviewed in years past who grow such vegetables. They admit organic is a goal but not yet an absolute acheivement.) “I don’t want to lie to the people,” Jib says. So, no big sign declaring organics at Grandma’s. What we do find on our next visit: a colorful chalkboard declaring no MSG. If you’re interested in real Thai food, Grandma and Jib are delighted to give it. In fact, Jib will give you the dinner off her plate, if it’s a Grandma special and it sounds like something you might like. Or she’ll offer to fry up a mound of fresh vegetables, whatever she has on hand from the market that day (such as local fern-like greens mixed with garlic, not often found on tourist menus). We choose Grandma Lek for our last meal in Chiang Mai before departing for Cambodia. Grandma finishes before we do. As she’s walking out the door, she turns to her granddaughter and asks, “Are they coming back tomorrow? Because I want to cook something special for them.” As though she hasn’t already. All over the world, grandmas who love to cook and feed their families also enjoy feeding the friends of their families, and sharing their favorite recipes. Best wishes and luck to Grandma Lek! Never did meet you when we were both in CM full-time, but absolutely love reading your blog. Makes me homesick every time. I’ll go see Yai Lek when I’m back in November. Until then, I’ll pass my days here in the Hudson Valley of NY, where we have a little Thai restaurant nearby. JRR, a good reason to salute all the world’s grandmas! Pam, sorry to have missed you. Enjoy your time in the Hudson Valley, which sounds supremely refreshing right now as I sweat in my seat at an Internet shop in sunny Kampot, Cambodia. Too hot. Thanks so much for the wonderful review of our restaurant and of course Grandma’s cooking. We are happy to celebrate national Mother’s Day month here in Thailand and Her Majesty Queen Sirikit’s Birthday on the 12th of August. Grandma continues to cook daily when she is not in Bangkok visiting my Auntie. Very unfotunately we had to close the restaurant in town where you visited us, but there is another family restaurant located at my Grandparent’s house right next to our house and cooking school. We would love to have you visit again on your next trip to Chiang Mai. Again, Thankyou for your kind words. Jib, I’m so sorry to hear you’ve had to close the restaurant in town–it was such a great addition to that area. But we’ll see you at the other restaurant on our next trip!